This site is designed to be a gallery of my work. The pieces shown are items that I have made in the past and may not still be available. I always have a wide selection of items available. If you see something you are interested in please contact me to see if it is available. If it is not I may have something similar. Please keep in mind that all pieces are unique and one of a kind. All pendants come strung on an adjustable 36" Rat Tail (nylon satin like) cord. All marbles include a stand. I'm now offering classes. See www.localartisancollective.com and click the "Calendar" tab for details. See my "Stores and Shows" page for a list of sites and stores where I sell my work and a schedule of upcoming events where I'll be selling and showing my work. Like my page on Facebook for a chance to win glass. I do a giveaway at every 250 likes. 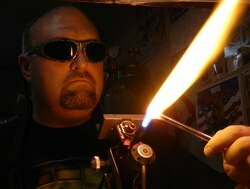 Mike Hurst is an Ogden, Utah based lampworker who specializes in pendants, jewelry, marbles and more. He began working with glass in January of 1994. Since that time he has passionately studied and practiced the art, always striving to perfect his techniques and learn something new. In addition to lampworking, Mike has experience with glass fusing, glass etching and neon sign making. Mike’s work is inspired by nature’s beauty, pop culture, the strange and macabre. Halloween is his favorite holiday, which is noticeable in his work. Hurst’s evil eye jewelry have become some of his most popular items and his signature pieces. Mike has been featured in Glassline magazine and several local publications. He sells his work online, locally at galleries and at arts festivals and farmers markets. Glass rods and tubing are heated to temperatures reaching 2300 degrees using a propane / oxygen torch . The glass is then sculpted with various graphite & metal tools. Each piece is then kiln annealed to reduce stress and strengthen the glass. All of my pieces are signed with my initials and the year it was was produced using a titanium pen. Please note: Glass can be very tricky to photograph. Due to differences in computer and monitor settings, the items seen on my site are generally much clearer & brighter when seen in person.